Kentucky is home to two fantastic fox species: the Gray Fox and the Red Fox. While both belong to the Canidae Family they are distinct cousins from different branches on the tree (note the different scientific names). Foxes are a delightful part of folklore and have a well-earned reputation for being cunning and sly. They are very intelligent and a tad sneaky! So as an animal mom, I should not pick favorites. BUT…. I think it's obvious that I love foxes. Foxes are my Native American spirit animal and have captivated me since I was a small child. I have several blinds on the farm where I can unobtrusively watch a fox den. In this article, we explore the biology of the fox, the fox in literature and what humans can do to help the fox as well as protect their livestock. The Red fox (Vulpes vulpes) is the most widely distributed carnivore in the world. It is also considered an invasive species in many countries. The red fox originated in Eurasia and first came into North America during the Wisconsin Glacial Episode some 25,000 years ago. Europeans brought the European Red fox over from Europe during colonial days for sports hunting. They quickly spread and now inhabit most areas in the continental USA. They are least likely to be found in the desert regions of the southwest. The Red fox has red fur along the face, sides of the body, back and tail. The throat, chin, belly and the tip of the tail are white or greyish white in color. The large pointy ears are tipped with black and they have black feet. The Red fox has a beautiful, long, bushy tail which is sometimes two-thirds of its body length. The tail provides balance, keeps the face warm during winter and is used in communication. The Gray fox (Urocyon cinereoargenteus) evolved during the Pliocene Era about 3.6 million years ago. 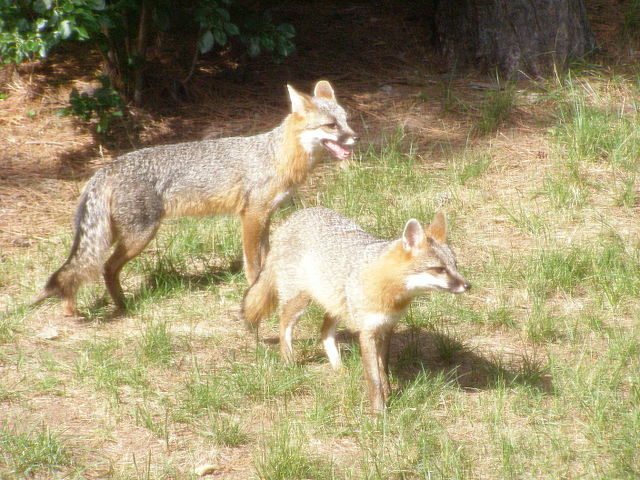 Gray foxes are smaller than reds, darker in color and have shorter legs. They weigh an average of 7 – 15 pounds and are more likely to inhabit woodlands in parks and rural areas. The move around more so then the red fox. The gray fox has hooked claws which are very adapted to climbing trees. This works well as an escape from predators such as the coyote and the domestic dog. Gray foxes have a black-tipped tail which is one way to tell the difference between them and the white-tipped tail of the Red. Like humans, both red and gray foxes are omnivores and eat both animals and plants. Depending on where they live, they may eat mice, moles, rabbits, birds, frogs, and eggs. They also like to forage on wild fruits such as persimmons, strawberries, black raspberries, and grapes. Foxes will sneak into orchards to each fallen fruits. Foxes in urban areas may include garbage and pet food in their diets. Foxes are solitary hunters and typically hunt in the early morning and late evening. The use a combination of senses to find prey. In winter they will listen for rodents under the snow then jump into the air and land by the unsuspecting prey. Where Do Foxes Live in Kentucky? Foxes live all over the state of Kentucky in rural, suburban and urban areas. Foxes in nature are normally quite shy and reclusive. Most foxes live in woodlands and near fields where there are abundant mice and rabbits. This, however, is changing. I get several calls every season from urban areas with fox sightings. Red Foxes are adaptable like their dog cousins the coyote (due to that intelligent brain) and are learning to live successfully in urban areas. The Gray Fox is more reclusive and prefers woodland areas. Help us know where foxes are in your area. Comment below with what areas of Kentucky (urban or rural) that you have observed foxes! Female foxes are called vixens and the babies are called kits or sometimes pups. Male foxes are called “dogs”. Mating season occurs in winter typically in January and February. Foxes are usually monogamous and live in small family units. Gestation is from 49-56 days and consists of four to six kits in March or April. At birth, the kits cannot hear or see. They have no teeth and are quite helpless. The kits cannot thermoregulate (make their own heat) for the first three weeks so the mother stays with them while the father hunts for the family. Another female, often the previous year's sibling, may also help care for the kits and hunt for the family. 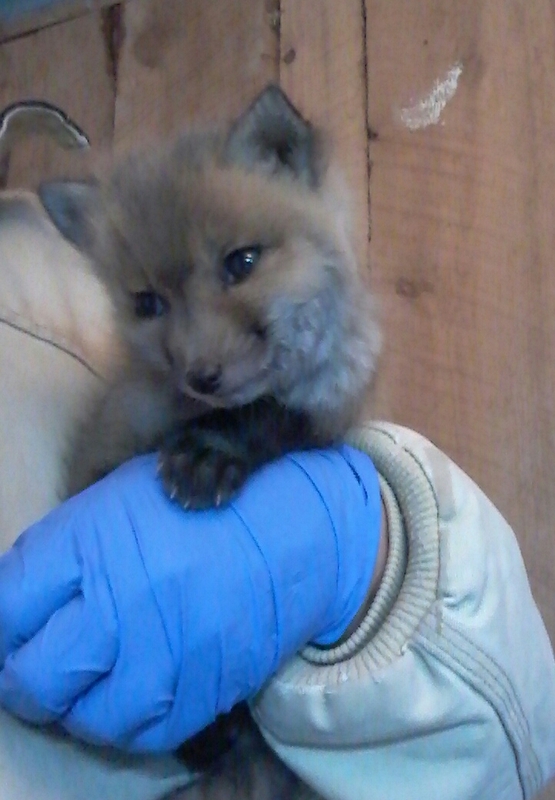 The vixen has four pairs of teats and nurses the kits for two months and sometimes longer depending on food supply. The kits begin to sample solid or regurgitated foods at about four weeks old. At thirteen to fifteen days the kits eyes and ear canals open and their senses develop. They develop their baby teeth at this time. Kits start to explore outside the den at six weeks old and are following mom and learning to hunt at three months. This is a dangerous time for the kits as they are susceptible to predators – including the human kind. The family stays together till the kits are about six months old. At this time young males start to develop sexually and tend to go out on their own or may be sent off by dad. In the wild foxes live for around four years. In captivity, they are known to live fifteen years. At Fox Run Environmental Education Center we rescue, rehabilitate and release several foxes each year. Fox kits come to us in a variety of situations. Some are found emaciated and in immediate need of intervention. These kits obviously do not have a parent around to care for them. Sometimes kits come in which are perfectly healthy but have been orphaned due to the parents being trapped and/ or shot. Occasionally people “find” young kits wandering around. These kits are doing what comes naturally and exploring their world. Please do not touch or interfere with them. If they have good coats, are walking well and look curious, interested or even cautious of you assume mom or dad is nearby. Please help us continue to rescue and rehabilitate foxes by becoming a member of Fox Run. The fox den is another fox related word that has made its way into our culture. The “fox hole” is a military term that describes a defensive hole dug by soldiers during combat. A fox den, is the foxes home, and is a hollow in the ground, often under logs, trees or outbuildings. They may also be built into a slope of a hillside or creek bank. Foxes may use their dens all year but they are most widely used during birthing and raising young. At other times the foxes may seek out a den during bad weather or times of stress. Dens may be shallow, only a foot deep, or may go down eight feet with several side tunnels. In Kentucky, foxes are considered a rabies vector species. While not nearly as common as bat or skunk rabies it is estimated that about 3% of foxes may carry rabies. Last year there were two positively identified rabid foxes that had bitten persons who received immediate treatment and survived. We vaccinate all our young wildlife against rabies to protect them as well as any humans they come in contact with. Interestingly, Germany has reduced their fox rabies to less than one percent. German wildlife biologists rid their country’s fox rabies by having an aggressive trap/ vaccinate/release program. Some states in the USA are going towards trap/vaccinate/release programs to protect wildlife and humans. Oral Rabies vaccinations have also proven to be successful with fox populations in Europe. We feel the United States would benefit by using some of these prevention methods. Foxes also suffer widely from distemper. Distemper is common in Kentucky wildlife and affects coyotes, raccoons, skunks, otters, and mink. Distemper affects the respiratory and nervous systems of animals, is highly contagious and can be transmitted by sneezing and coughing. Humans do not get distemper. Another issue that we see in foxes in Kentucky is mange. Mange is caused by a parasite that gets into the skin causing hair loss and intense itching. Mange is highly contagious and can be transmitted to domestic animals. They may itch so badly that they are unable to hunt and therefore lose weight and became quite sickly. Mange is treatable, although treatment times vary depending on the species of mange. Foxes also are known to occasionally have neurological issues and encephalitis. 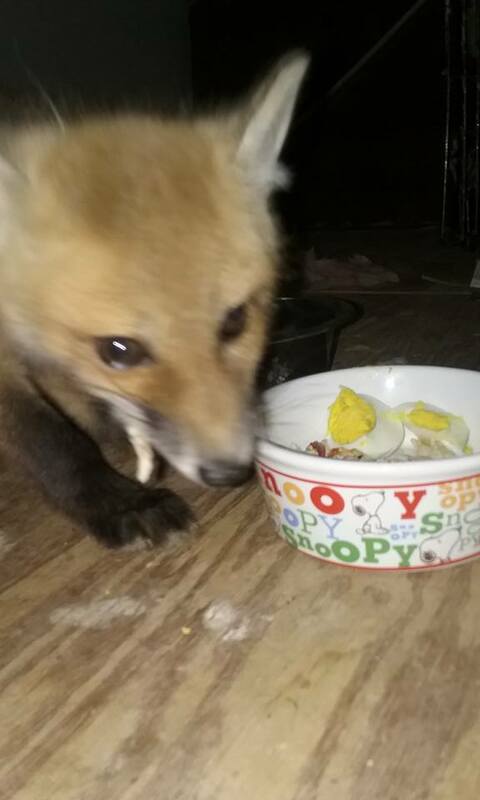 We sometimes find this in rescue foxes when we are rehabilitating them. I have had two kits that eventually died from seizures. There are a number of complex issues that cause this. We work with our veterinarian, Nathan Glaza DVM., to research and analyze our foxes blood and tissue cultures to find ways to successfully treat medical issues. Sadly, Kentucky has a “no limit” trapping season for foxes from November to February. This is very concerning especially for Gray Foxes. Foxes are trapped for their fur which is used to make clothing. The gray fox has seen population decline and is currently being protected in the neighboring state of Ohio. At Fox Run Environmental Education Center we do not have a problem with legal, ethical hunting done in traditional a manner. We feel that trapping is unethical because it causes the animal undue pain and prolonged death. An animal should not suffer and be mistreated. Foxes sometimes come into conflict with humans. This often occurs when they prey on a farmers livestock, most often poultry. Poultry runs and tractors need to be built so that foxes can not enter them. Tips for building predator-proof poultry housing. 1. NEVER use chicken wire. Chicken wire is useless for predators such as foxes, raccoons, and opossums. 3. When building an outside run bury the welded wire at least two feet under the ground. 4. Cover your chicken run or tractor. Both foxes and raccoons can climb up and over. 5. When using a chicken tractor put a wire floor in the bottom. I use larger welded wire for this so the chickens can still eat the grass and bugs. 6. Electric fence netting works well for some predators. Personally, I just shock myself and am not a fan, but I have farm friends who swear by them. Foxes are occasionally blamed for killing cats. This may be more of a competition issue than a hunting issue with the fox. I have cats and have never lost any to my rescue foxes. Rabbits need sturdy cages and a house section that they can go in at night so that predators can not grab them from underneath. Rabbits that live in mobile tractors during the day should be secured in a hutch at night. Foxes can be scared off by loud noises. Banging pots or having a radio on a hard rock station can deter them. It is illegal to keep foxes as pets in Kentucky. Kentucky has laws against keeping any native wildlife as pets. If you are interested in working with native wildlife you can become a volunteer for a wildlife rehabilitator. Kentucky Wildlife Rehabilitation Association has information on how to become a wildlife rehabilitator. A very few states do allow foxes to be kept as pets. This is usually exotic fox breeds such as the Fennec Fox and the Silver Fox. Speaking from experience working with foxes, I do not recommend keeping foxes as pets. Foxes have an odor and are conditioned to mark their territory. They frequently urinate on bedding and in dishes or other places they deem as theirs! Foxes need outdoor enclosures that allow them plenty of space to run. They also nip and bite as part of play behavior and can become aggressive towards people and other animals. Sadly, in states where foxes are legal there is a very high rate of abandonment. Sometimes owners just turn them lose which is a death sentence for the animal. The word “fox” comes from the old English *fuhsaz relating to its bushy tail. Foxes have long been part of literature in both oral and written traditions. Many sayings such as “sly as a fox” and “old foxes want no tutors” (Dutch proverb) describe the cunning and intelligent nature of the fox. We also often compare humans to foxes. “The sleeping fox catches no poultry” attributed to the hard-working Benjamin Franklin, pretty much says you won’t eat if you don’t work. In the 1960’s music scene the term “foxy” was coined to describe an attractive woman. Jimi Hendrix’s quintessential Foxy Lady is a tribute to that era. Aesop used fox as a teacher. Here is a delightful telling of the Fox and the Grapes from the Library of Congress. Chinese mythology sees the fox negatively. They believed that the fox was a female shapeshifter who preyed on weak-willed men. One of my all-time favorite books is Fantastic Mr. Fox by Roald Dahl. I love the way Mr. Fox outsmarts the three nasty farmers and saves the animals. If you have children in your life you owe it to them to buy this book! The fox is admired in many Native American cultures because of their ability to move stealthily and quietly. The fox is a symbol of determination and perseverance. My ancestors were Cree. Grandmother Fox was an important heroine in Cree culture. She was a wise elder who sometimes is in the form of a fox, other times in the form of an elderly lady. Grandmother Fox plays adopt Ayas, as her grandson and give him advice and items of power to use in his quest. Ayas becomes a hero who often makes life better and is responsible for bringing the fire. Ame Vanorio is a freelance writer and the founder/director of Fox Run Environmental Education Center in Falmouth, Ky. We teach environmental education programs and serve as a licensed Kentucky wildlife rehabilitation center. Your donations help us to rescue and save Kentucky wildlife! Older PostOpossums: Kentucky's Only Stunning Marsupial!